'Computer dating is fine.. if you're a computer.' Rita May Brown. Welcome. If you have found this page, the chances are you were looking for information regarding to the low-budget rackable systems servers that have become available recently. (end of 2009) This page contains some useful links, and important information, to help you get your box up and running with all the advertised bells and whistles. There appears to be quite a bit of variance of the spec of the box but a lot of the things in this page will revolve around the management card so thats unimportant. So, "whats the problem?" I hear you ask. Well it appears that in their infinite wisdom, during Rackables aquisition of SGI, they have hidden all the original Rackable Systems documentation, drivers, and information. While the basic operation of the hardware is pretty simple to figure out, the operation of the management card, and some of the other bits requires a bit more guidance. So after much searching i have found this information and i present it here. Ok. So. Down to the nuts and bolts. Unlike most power supplies, this small form factor 400w unit is modular. That is to say that all the cables plug into the PSU, rather than being hard wired into the case. While thats handy, should you ever need to replace the PSU, the actual availability of these PSUs appears to be somewhat limited. You would probably have to go back to Rackable / SGI to get a replacement, and given the price of the servers on Ebay, its probably cheaper just to buy a new box. As I said above the actual PC specs vary, but the main model that I'll be talking about here is the C2004 Dual Opteron server. This model is based on the Arima Corp HDAMA motherboard. Drivers and manuals for this board can be found here: Arima Corp HDAMA Downloads. Be aware, in some of the research I have done I have discovered that certain BIOS revisions break the console redirection. Don't update unless you think you need the new features, and check to make sure you take a backup or have a copy of the original version before you flash. Something else to consider is the ram. According to the manual, this board takes Registered ECC ram. Specifically you need PC2100	or PC2700 DDR 1 ram. Theres plenty available on ebay for not too much, but check who you are buying from. There are a lot of dodgey dealers out there who sell knackered ram. Remote "lights out" management is one of the features that seems to have caught most peoples eye when it comes to these servers. The problem is that information surrounding the cards is next to non-existant. After a lot of hunting I have come up with the following info. IP Management with Serial Over LAN. The serial only option adds some additional features beyond basic console redirection including Temperature monitoring, and remote power control. Out of the box the XPort should "just work" however its not obvious how. Experience has shown that the web management tool is not installed correctly on any of the ebay units seen so far so first steps have to be made using the telnet interface or the device installer application. If you already know what IP address the device has chosen you can just point a telnet client at that IP address on port 9999. This will connect you to the XPort administrative tool and produce something like this. From this menu you can setup IP settings, tweek the serial settings (which is the speed at which the xport talks to the roamer - best to leave that alone), the ports for the Serial Over LAN, and some other settings that I haven't quite figured out yet. The install software will automatically search the local subnet for any XPort (and similar) devices and present them in a tree view for you to see. From here you can browse the current settings of the device, connect to the web admin, telnet, and push out updates. As I said earlier, the web admin on these devices is normally not setup properly initially so you will need to do that yourself. Before we do that, you'll want to get the updated firmware installed. 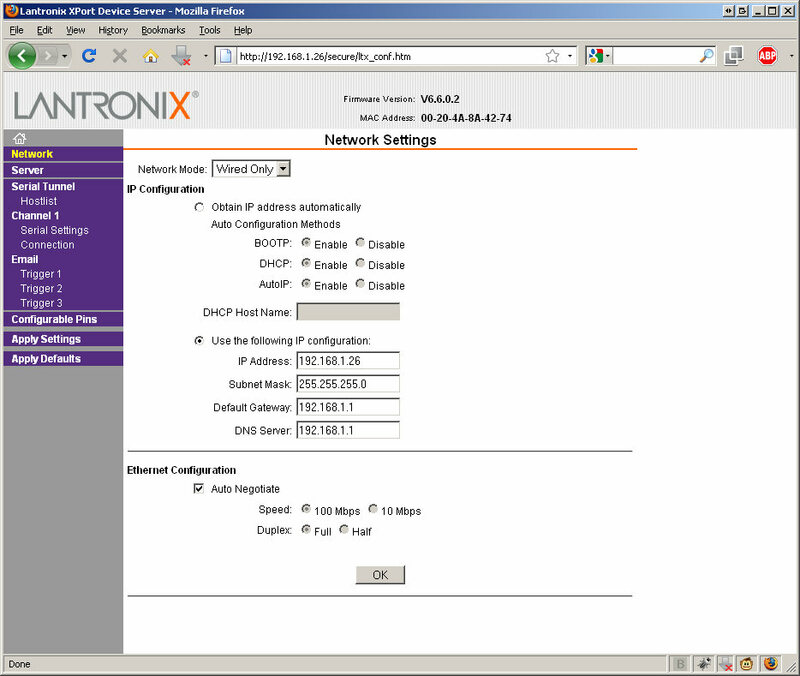 To do this, simply download the firmware from the Lantronix site here: Lantronix XPort Firmware (currently v6.6.0.2), Also grab a copy of the web interface (v1.7.0.1) for installation in a moment. Check the version of your Xport (it will tell you when you connect via telnet). If you are running version 6.x You shouldnt need the "Loader" as this was intended to upgrade from version 1.x to 6.x. Once you have the filesand hit the upgrade button on the installer. Select the firmware, and nothing else. Follow the prompts and it should start installing the update. Make sure you dont have any active telnet sessions as this can break the update. Once the update is installed, it will reboot the XPort and telnetting back in will confirm the upgrade has taken effect. To install the web admin update repeat the update process, but this time dont select any firmware on step 2, and select the COB partition option on step 3. At step 4 select partition 1, hit set partition, then select the COB file. Then complete the wizard. You should now have a working web admin page. Just point your browser at port 80. Once you get this far, you can now send control commands to the Phantom card to get into its administration mode. Press "CTRL + SHIFT + 6". Then press "?". This will result in the following menu.